The ‘NetEnt Rocks’ series of slot games released back in 2016 was a breath of fresh air for the industry. Here was a super-fun game that incorporated original recordings from some of the world’s premier rock bands. The Jimi Hendrix Experience and Motörhead were two of the holy trinity, but it is perhaps the third – Guns N’ Roses – that hit the right note for gamers. Everybody’s favourite debauched rockers signed on the dotted line with NetEnt, and are sure to get those reels a-rocking and toes a-tapping. 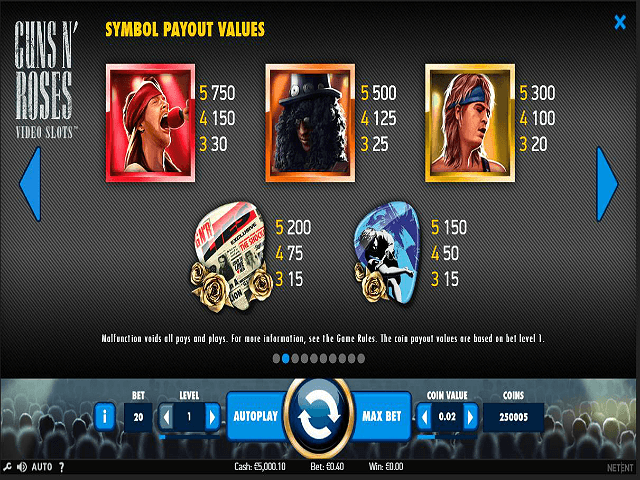 Featuring some of their greatest hits, Guns N’ Roses online slot is more than simply an ode to Axl Rose and co. NetEnt have created a highly original game that stands up to scrutiny in its own right, whether you're a fan of the band or not. So, are you ready to rock? 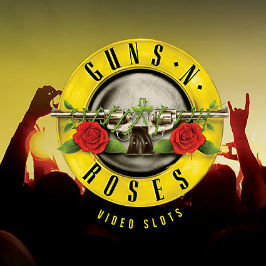 Play Guns N' Roses Slot Demo for Free! Play Guns N' Roses for Real Money! There are so many special features and bonus rounds in Guns N’ Roses that it's hard to know where to start. Let’s start by tuning up with some basics. Players have five reels and 20 paylines at their disposal, with coin values and bet levels up for modification: the game fits any budget. Your gaming will be accompanied by four of GNR’s finest moments: Welcome to the Jungle, Sweet Child O’ Mine, Paradise City and November Rain, as well as their anticipated new release, Chinese Democracy. Further stabs of music and guitar shredding occur when you land one of the game’s big prizes. As far as the main game symbols go, the playing card icons have been given the famous red rose treatment, while the best-paying symbols are the three lynchpins of the band through the years: Axl Rose, legendary guitarist Slash and bass-slinger Duff McKagan. As the frontman, Axl pays out the biggest prizes with a whopping 750 coins available for matching five of him on your reels. 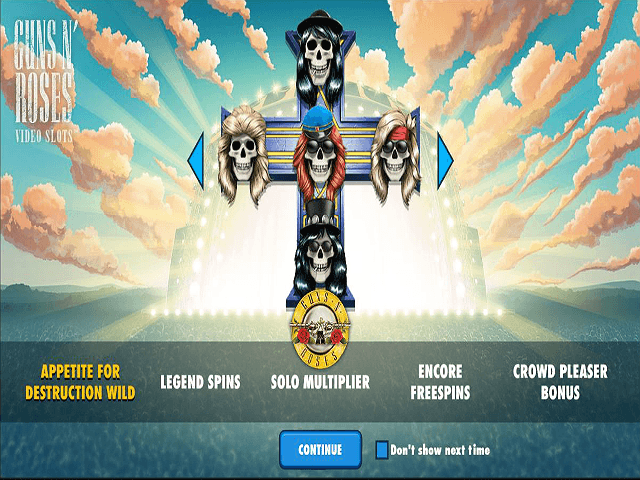 There are a number of different special symbols in Guns N’ Roses online slot, and each of them will have you singing your heart out! The GNR logo is the wild, and this comes in both standard and expanding form. These substitute for all basic symbols (but not other ‘specials’) to create new and/or bigger winning combinations where possible. The game also features a bonus symbol, which is the vinyl record. Land three or more of these on reels 1, 3 and 5 and one of a trio of features will be activated: Coin Win, Encore Free Spins or the Crowd-Pleaser bonus. The bonus wheel will spin and you can click stop at any time, identifying your chosen feature. The Coin Win prize is dictated by the bonus wheel. This features a number of different cash prizes, and your amount is dictated by your spin. The Crowd-Pleaser feature is another ‘pick ‘em’ style round containing three levels. 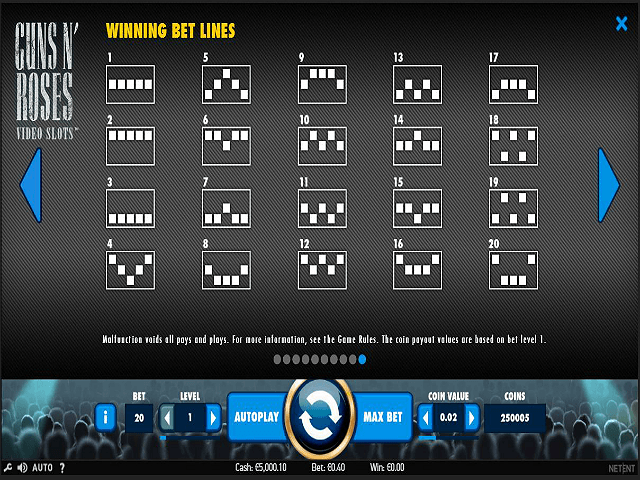 There are three selections here, with a minimum available win of 60 coins. Accumulate more than 60 and you'll unlock Level 2. To access Level 3, you'll need to have totalled 300 coins or more from the first two rounds. The Encore Free Spins round is as the name suggests, with ten freebies handed out in the first instance. Here either Axl, Slash or Duff will appear as a stacked wild on any of the middle three reels, with another band member acting as a standard wild on one of the other reels. Share this Guns N' Roses Review today! 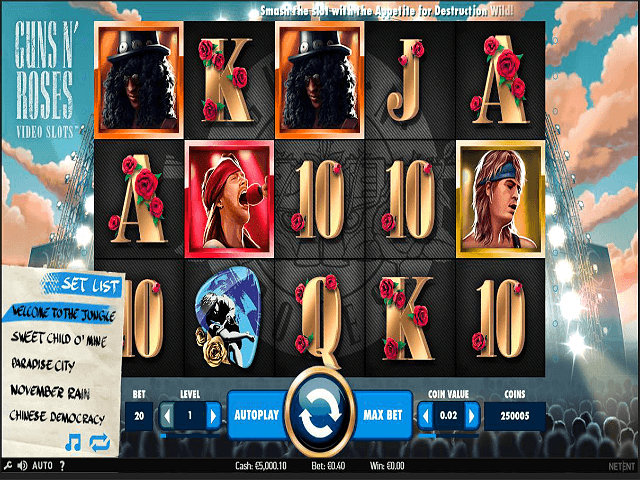 If you like Guns N' Roses, you'll love these slot titles too!